These kindergarten teachers from Cedar Creek Elementary School in Bastrop ISD are enthusiastically implementing Writing Workshop in their classrooms. HTWP is supporting their professional growth through onsite model lessons, coaching, co-planning, and workshops at UT. The Heart of Texas Writing Project offers a variety of professional development models for schools and districts. We often kick off our work over the summer with a 1-2 week institute for school or district-wide staff and follow up with on-site visits that include responsive coaching through providing resources, planning support, and modeling lessons in classrooms with K-12 students. Teachers benefit from in-depth conversation, readings, and curriculum design alongside local, Heart of Texas, expert teachers of writing. Below is a professional development profile as one example of our on-going work in Austin area schools. Summer 2016: To begin this district-wide, K-12 initiative to bring Writing Workshop to Bastrop ISD students, Heart of Texas Writing Project Teacher Consultants trained Bastrop ISD’s K-12 English and Bilingual Language Arts Teachers through 5-day intensive mini institutes. During each mini institute, teachers read and discussed professional texts, planned for the implementation of writing process pedagogy in their classrooms, and engaged in the writing process. 2016-2017 School Year: Heart of Texas Teacher Consultants built on the district-wide summer work through 80+ coaching visits with K-12 English and Bilingual Language Arts teachers to Bastrop ISD’s Elementary, Middle, and High School campuses. On-site coaching visits included model lessons, planning sessions, and other professional development meetings such as time to look at student work together or read and discuss professional literature. 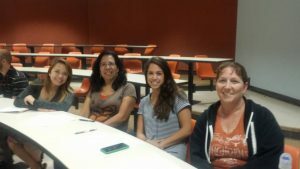 Summer 2017: Heart of Texas Writing Project Teacher Consultants will facilitate 5-day mini institutes for Bastrop K-12 English and Bilingual Language Arts teachers who did not attend the Summer 2016 sessions. 2017-2018 School Year: Heart of Texas Writing Project Teacher Consultants will provide 80+ coaching visits with K-12 English and Bilingual Language Arts teachers, working with teachers to hone their practice as writing workshop teachers and to identify opportunities for inquiry, responsive teaching, and professional leadership opportunities on their teams, campuses, and in Bastrop ISD. Let’s make your district or school the next profile in PD we publish on this site! Contact Deb Kelt to design a plan!